Barefoot Resveratrol Anti-Aging Tonic: Resveratrol Anti Aging: What makes Vivix by Shaklee different? 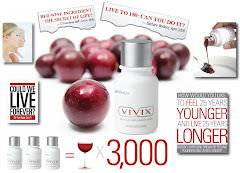 Resveratrol Anti Aging: What makes Vivix by Shaklee different? "...The answer to that question is really three-fold. In the first place, the resveratrol in Shaklee's Vivix is a higher potency, higher purity preparation than many of the other resveratrol supplements products on the market. For those resveratrol supplements that are potent enough, many aren't pure enough. There is a naturally occurring contaminant in impure resveratrol preparations that has a laxative effect. Unless the resveratrol preparation is 98% pure or better, many people will find that the side effects outweigh the beneficial effects. But the most important reason is that resveratrol cannot do it all. It is just one of many naturally occurring polyphenols, which is why Shaklee added a polyphenol blend from muscadine grapes to their purified resveratrol. For example, Shaklee's polyphenol blend is high in ellagic acid, which is not found in significant amounts in red wine or most resveratrol preparations. Ellagic acid inhibits an enzyme that is involved in the formation of advanced glycation end products (AGE proteins), one of the central four mechanisms of cellular aging. Resveratrol has no effect on this enzyme, but does block the other three key mechanisms of cellular aging. Similarly, animal studies suggest that ellagic acid shines in preventing gastrointestinal cancers, while resveratrol and other components of the polyphenol blend that Shaklee uses prevent a variety of other tumors.